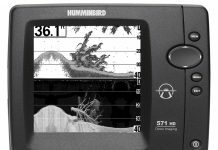 The Humminbird ICE 35 is a little different than your traditional fish finder – this model is meant specifically for ice fishing. So instead of a traditional display where you get full SONAR readings, the ICE model is what is known as a “flasher”, where you’ll basically see the colors move around the dial. Depending on what’s below you, you’ll see a reading – and that’s how you judge whether or not to cut a hole in the ice! The ICE 35 is a dual beam flasher which means your readings will be more accurate – there’s more data to go on. 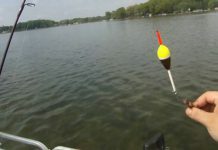 It performs pretty well and has a max depth of 200 feet – but frankly, you won’t need to go that far – most of your fishing will probably be much closer to the shore, unless you like going fishing in the deep North where you wouldn’t know if you are walking on a lake unless you had a map with you! 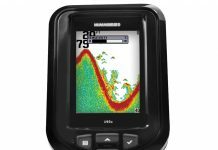 The power on this thing is pretty decent, too – the batteries last for much longer than a few fishing trips, and the led display is pretty bright so you can see in dark conditions, too – which is useful for fishing in the short winter days. When you receive the ICE 35, it will be unassembled – assembling it is pretty simple, but you should budget about 35-40 minutes for assembly. 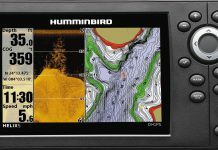 There’s a demo mode which is very useful to get to know your fish finder before you take it out on the ice. When you’re on the ice, the readings will be either red, yellow, or green. Red is strong, yellow is medium, and green is light – think rocks, big fish, and small fish. 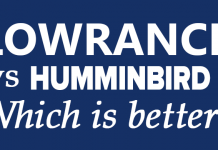 A lot of what you’ll be doing with this is putting the transducer down on a certain area, waiting to see what kind of readings you get, and moving on – not unlike what you would do in a boat. 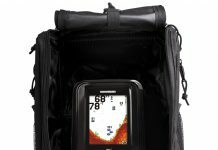 At the end of the day, for less than $300, the ICE 35 is an excellent catch for the enthusiastic ice fisherman.